If you enjoy the romance of Valentine’s Day but hate that it’s only one day a year, then Burning Desire may be for you. This Microgaming slot is themed on love and passion, which we at Boku Slots quite enjoy. But is it enough to make you fall in love? 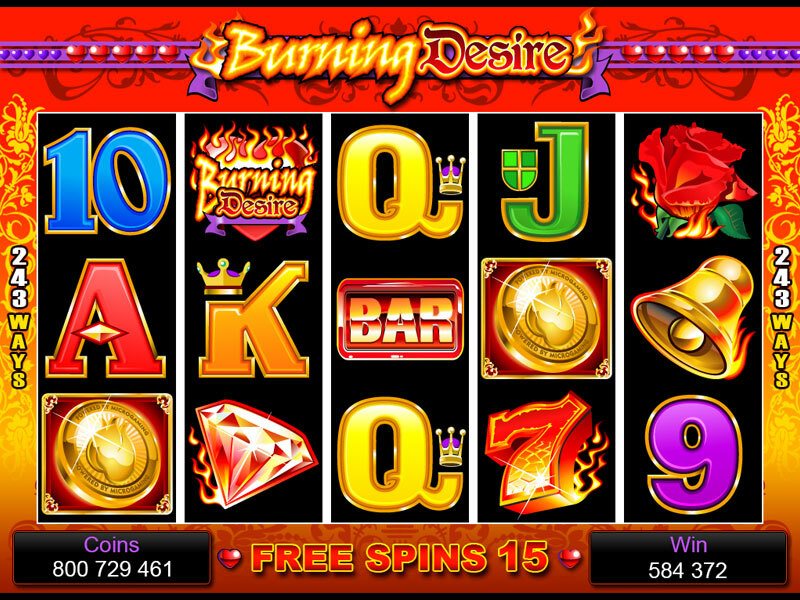 Burning Desire is a 5-reel, 243 ways to win slot offering a lovely 96.19% RTP to its players. The game itself is basic in design and hails back to the days before video slots were even a twinkle in our eyes. Bet Amounts – Betting begins at 25p per spin and can be increased to £250 per spin, so always make sure you have set the right bet amount before hitting spin. The only thing you can adjust here is the coin value and coin level. Wild Symbol – The burning desire logo is your wild symbol and it substitutes for all other symbols except the scatter. It will also only land on reels 2 and 4 during play, so keep an eye out for that. Scatter Symbols – A golden coin is your scatter symbol and if you land three or more anywhere on the reels, then you will trigger the bonus spins feature. Bonus Spins Feature – There are 15 bonus spins up for grabs if you land 3, 4 or 5 scatter symbols on the reels during the main game. Once the spins are in play all wins are tripled and the bonus spins can be retriggered as well. Gamble Feature – As is often the case with slots there is now a gamble feature for you to use on each win, if you want to try and double or quadruple your win. Once you have won from the main game, you can choose to gamble. You will be taken to a new screen and presented with a card turned face down. You have the choice of doubling your win by correctly guessing the colour of the card, or quadrupling your win by guessing the suit. If you guess wrong, you lose it all. The option to go again on the gamble feature is there, but our advice would be not to gamble too often as you are more likely to lose it all than gain. As we said, Burning Desire is a basic game in design and execution, however that RTP is high for a reason. The wins trigger often and the game play is interesting enough to keep the boredom at bay. It may not be an all guns blazing kind of slot, but what it does give you is beautiful graphics and a lovely soundtrack.